Support Paul to make good things happen for our region, even a small contribution can make a big difference. What you think and believe can make a difference, making a difference begins with you. Thanks for visiting my website. I intend to continue to play a role in helping Stafford County and the Fredericksburg region find innovative solutions to the problems that affect our quality of life. This website is a platform for me to share my perspective on these issues, and to keep you updated on what I’m working on. I always welcome your feedback. Be sure to subscribe to my e-mail list for the latest news. Paul Milde is dedicated to defending the rights of the unborn. He understands that all life is precious and should be protected — and that a new human life starts at the moment of conception. With Gov. Northam and the radical left pushing for extreme abortion laws, now more than ever, Paul knows it will take men and women who are willing to stand strong and fight for the rights of the unborn. 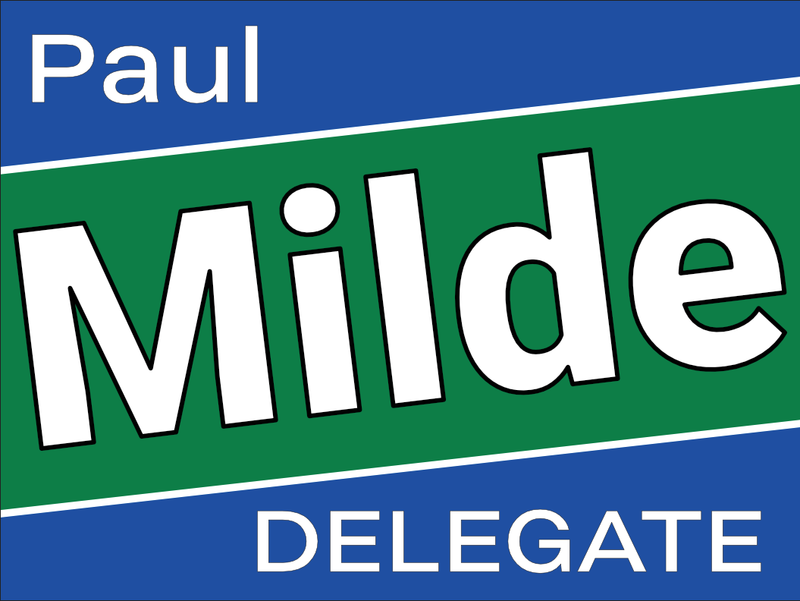 Paul Milde will work hard to improve infrastructure. Paul has a track record of developing infrastructure while on the Stafford Board of Supervisors. He’s been pivotal in starting, funding, and completing hundreds of infrastructure projects. As your delegate, he will bring the fight to Richmond to get the infrastructure funding the Fredericksburg area so desperately needs. Unfortunately, Paul’s opponent decided to double down on Obamacare by implementing its prescribed Medicaid expansion; the exact wrong thing to do if the goal is to fix our healthcare system. Through reversing Obamacare’s Medicaid expansion, Paul Milde hopes to create a better healthcare system making healthcare more affordable, saving taxpayers billions of dollars and cutting funding for abortion providers. Paul Milde is 100% Pro-Gun. As a life-long National Rifle Association member, Gun Owners of America member, and the Virginia Citizens Defense League member, Paul has always recognized the significance of the 2nd Amendment — that all Americans should have the right to keep and bear arms whether that be for hunting, sporting or self-defense. Right now, with the left at the gates with their ever-increasing calls for gun confiscation without due process, it’s more important than ever we elect someone who won’t cave. Paul Milde is a Stafford County businessman who served 12 years on the Stafford County Board of Supervisors. Paul has lived in Stafford since 1989 and has two grown children, Travis and Bailey. Paul is a lifelong entrepreneur who believes that with hard work and a willingness to innovate, we can find public policy solutions to even the thorniest of problems. Paul has a track record of success with this common-sense approach to government. His work to preserve Stafford’s Crow’s Nest peninsula proved that land preservation can be achieved without trampling property rights. As a three-time chairman of the Fredericksburg Area Metropolitan Planning Organization (FAMPO), Paul learned how important it is for our region to have a tenacious advocate for funding to address the perennial problem of traffic. Since his term on the Board of Supervisors ended in 2017, Paul has remained engaged in these and many other issues facing our region.